We field questions almost daily on different types of air pumps and inflation tools, and whether or not to use a pressure gauge or valve adaptor. Here is a short guide, answering some of the most frequently asked questions, but feel free to ask any others! 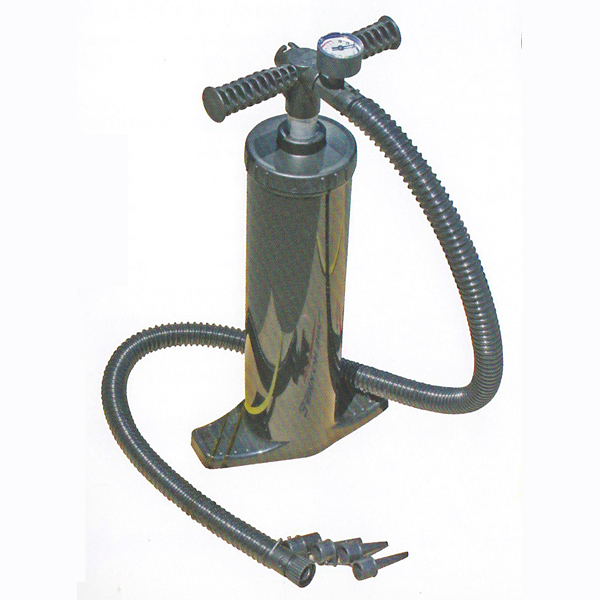 Double Action Hand Pump – this is a barrel-type cylindrical pump that pushes air in on the up and the down stroke. Tougher than a foot pump, but also larger. Has an inflate and deflate position on the pump handle. These are great for lower pressure inflatables, up to about 4PSI. Can be used on higher pressure inflatables, but you will earn every muscle getting it up there. Will pump up an inflatable kayak or paddle board faster than the single action pump or bellows foot pump. 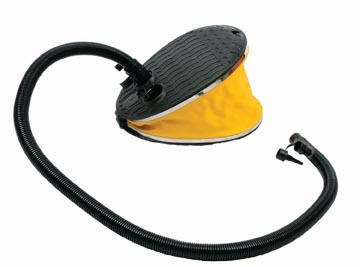 Bellows Foot Pump – A smaller-profile pump, good for carrying around with the kayak. Air is pumped in by using your foot, but only on the down stroke. Also has an inflate and deflate position. Good for people with back problems, as you will not be bending over the pump. 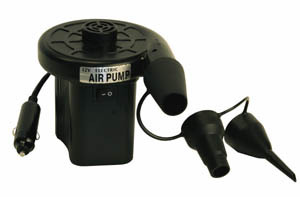 12 Volt electric pump – For use with a car power point. 12V pumps are fabulous for inflating most of the kayak quickly and with no effort, but they do not have the power to fully inflate a kayak. You will still need to use a hand or foot pump to top it off. Single Action Hand Pump – similar to the double action hand pump, the Single Action pump is a barrel-type cylindrical pump that pushes air on the down-stroke only. These pumps are excellent for high pressure inflatables, as they are much easier to pump up to 10+PSI – the standard pressure used for inflatable paddle boards. Bike and automotive tire pumps will NOT work, they do not have the correct connectors. Regular electric/compressor pumps are NOT recommended with inflatables, as they can easily overfill the kayaks and potentially pop a chamber. Inflation valves are the “connections” on the kayak that allow air to enter the kayak. The valve adaptor is the fitting that couples the pump hose to the inflation valve. Most of the kayaks we sell have the following types of inflation valves. Boston Valves – These are screw-on two-way valves. The bottom portion is screwed onto the kayak, the top valve is screwed open for inflation and then tightened shut after inflation. Air is easily released by unscrewing the base connector. 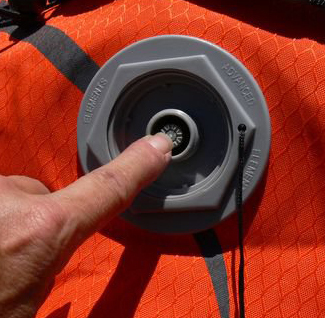 A flap inside the valve opens when air is pumped into the kayak, and falls shut when not pumped so that air will not rush back out. The Boston Valve adaptor is a “friction fit” (see images of Valve Adaptor Types below – A). Occasionally, the valve adaptors may be too loose, and will pop out. This can be rectified in a few ways. 1) Put some masking tape or duct tape around the adaptor, to make it a little thicker. 2) Use a rock or sandpaper to slightly rough up the outer surface of the adaptor, or 3) as the Boston valve is “tapering”, slightly cut down the length – this in effect will make the adaptor a bit wider, to friction fit better. Military Valves – A spring-loaded push-pin style valve. By turning to the “open” position (push pin is down), air can be pumped in, but it will also be released when the pump adaptor is removed. By turning to the “closed” position (push pin is up), air can be pushed in by pumping, but can not come back out. Use the open position with 12V pumps (which don’t have enough uummphh to open the closed valve position). Once inflation seems to end, quickly turn the valve to close it, and top off with another pump to full pressure. Use the closed position with hand and foot pumps. There are various types of military valves – most work on the same principal, but have different valve adaptors. Some of the military valves require specific adaptors to couple, such as the Halkey Roberts (F – this one is used on the Advanced Elements drop stitch floor, shown on left). The Advanced Elements military valves are a bit more universal – they can be inflated with the Advanced Elements screw on adaptor (C, also shown on right), or they can use a Boston valve adaptor via friction-fit (A). Twist-Lok Valves – These are small valves on tubes, typically used on small inflation bladders. By twisting the end cap one way, the air can be pumped in, and twisting back will lock it shut. 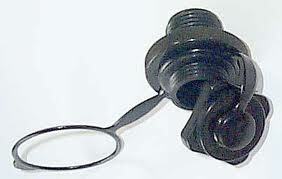 Most use the Boston valve adaptor, which fits over the Twist-lok (A). Jumbo Double Lock – Proprietary to the Sevylor/Coleman brands. To use the double locks, hold and pull up on the valve stem. You will see a yellow plug inside. This separates from the stem and allows air to be put in. Once inflated, hold the valve stem with the nozzle still on, and push down. This seats the valve stem back over the yellow plug, so air can’t escape. Then push on the cover. Conversely, to remove air simply pull the stem back off the plug. Utilizes the Boston valve adaptor (A). Pinch valve – A very simple valve with a flap to keep air from coming out. 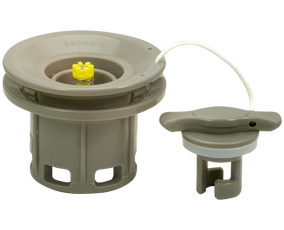 Use one of the long needle-nose style adaptors (D or E in photo) to insert into the valve stem – it should be long enough to push open the interior flap. When you remove the adaptor, the flap will close and you push the valve cap into the stem to close it. You need to “pinch” the valve stem base to get air back out. 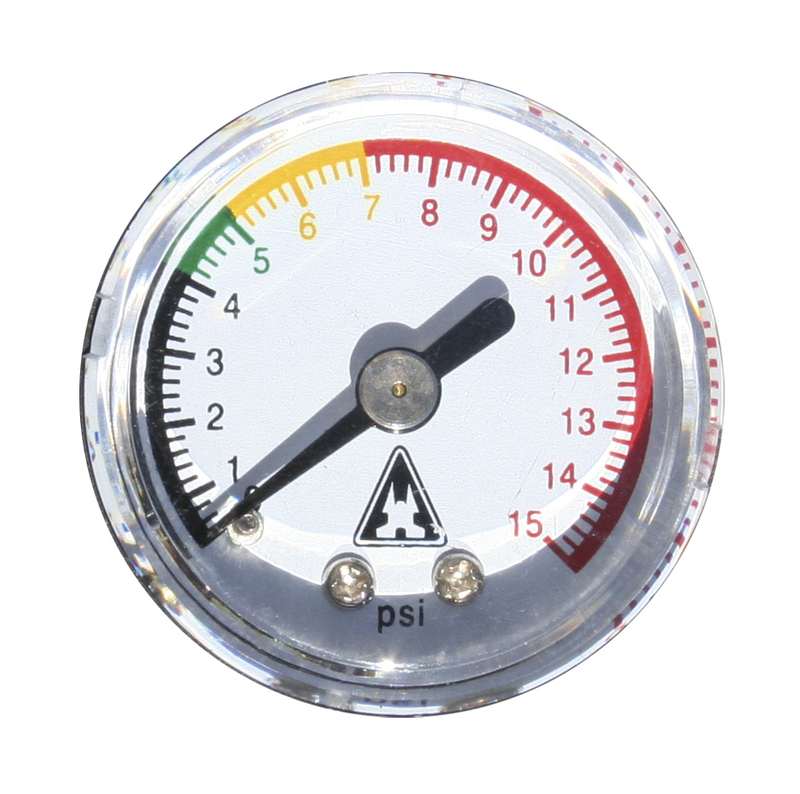 Pressure gauges will tell you how much pressure you’ve put into the inflatable. These are good as a rule of thumb, but you must remember that air and water temperature will affect the kayak pressure. If you will be in hot sun, under-inflate the kayak as the air will heat up and expand. If you will be kayaking in cold water, over-inflate slightly as the air will cool down and contract. There are various types of pressure gauges. 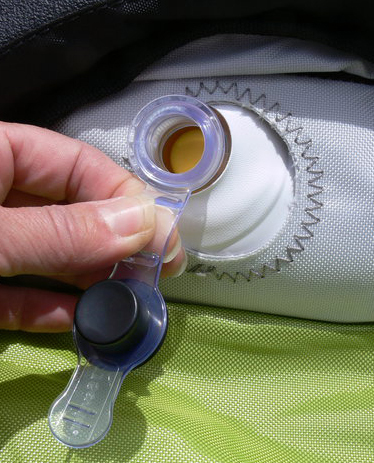 Some, such as the Sevylor manometer, are inserted into the valve after the kayak is pumped up. The Advanced Elements double action pump with gauge comes with a spring valve adaptor attachment. This screws onto the military valve and holds the chamber “open” so you can get real time pressure readings. The adaptor is designed to work with just the Advanced Elements military valves. Read your kayak instruction manual to find out the optimum pressure for each chamber in your inflatable kayak. If you don’t have a pressure gauge, inflate the kayak until “firm to touch.” What does this mean? For the main chambers, inflate the sides until it feels firm, like a drumhead, but not rock hard. If you lift the kayak up at one end, and it sags in the middle, then it has not been inflated enough and will be sluggish. The chambers that are most sensitive are the smaller chambers, and the floors with “i-beams” – these are the lower pressure PVC floors with seams running lengthwise. Inflate these until firm, but you should be able to press in about half an inch. And while on the topic …. NEVER leave your kayak fully inflated in the hot sun. If you have no choice, release some of the air from the chambers (somewhat limp), so when the air heats up there will not be enough pressure in the kayak to explode. And it WILL explode. We saw one poor kayak which had been left in the back of a pickup truck, fully inflated, in California 100 degree weather for 4 days. A sad sight. If you believe you have a leak at the valve location, run a soapy sponge around the valve to pinpoint the leak – bubbles will be visible. For Boston Valves: First, remove the valve entirely and then carefully re-thread it onto the kayak. Sometimes, the valve can be cross-threaded, or occasionally kayak material can interfere with a tight seal. If that doesn’t work, try swapping the valves. If the opposite side then has a problem, you know it is the Boston valve. Many inflatables come with an extra Boston valve in the repair kit, so replace the culprit. For Military Style Valves. First, make sure the valve is in the closed position and that the wing nut cap is tightened. Occasionally, the valves will loosen up initially. Many inflatables come with a wrench in the repair kit, which you can use to tighten the valve back on. 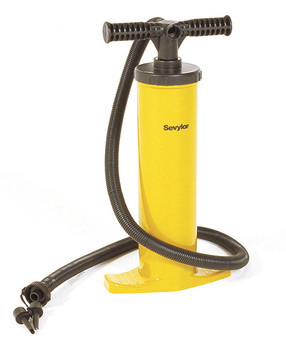 We keep three pumps handy – the double action hand pump, 12V pump and the bellows foot pump. When headed out with a few kayaks, the 12V pump is incredibly handy to get larger kayaks rapidly inflated about 80% of the way. Then we top-off the kayaks using the double action hand pump. The bellows foot pump we keep on-board as a “safety issue.” The smaller profile makes it easier to stash behind the seat or bungee to the top of the kayak for those rare emergencies. Most kayaks have a number of chambers, thus the deflation of one chamber will not not sink the boat, but it will make paddling that much tougher. You can also see our YouTube video on using the Advanced Elements valves.